I know, I know, here's another Malbec. I've been reviewing quite a few Malbecs. And I'm good with that. This is the 2009 Bodega Septima Malbec. Like most Malbecs, it's also out of the Mendoza Region of Argentina. I'm going to spare you the rambling on and get right to the wine. 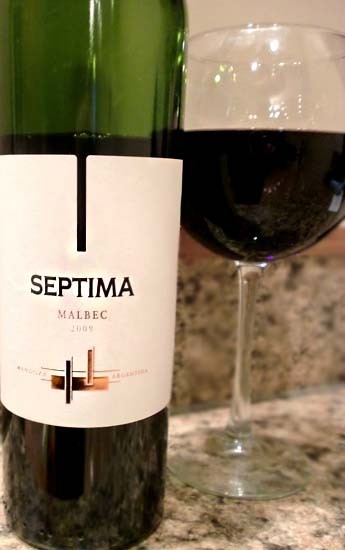 The 2009 Bodega Septima Malbec pours a rather dark, inky purple color. It has aromas of plums, blackberries, and some dustiness. Tasting is a bit boozy with notes of dusty plums, deep blackberries, hints of acidic citrus, and a touch of oak in the finish. Tannins are quite heavy. This is an interesting wine. It's rustic and chewy, yet acidic and boozy. It's not particularly well-balanced, especially due to the alcohol notes and could use a bit of time to open up prior to drinking. That being said, I do enjoy the good strong tannins and the rustic character here. Overall, with all things being considered, a slightly better and more interesting than average Malbec. Like many Malbecs, it is going to be polarizing in that people are either going to love it or hate it. Drink This: if you want a rustic, chewy Malbec. Don't Drink This: if you don't like your wines a little hot. The alcohol can be tasted a bit in this which is one of the main downsides. Letting it open up for a bit seems to help.